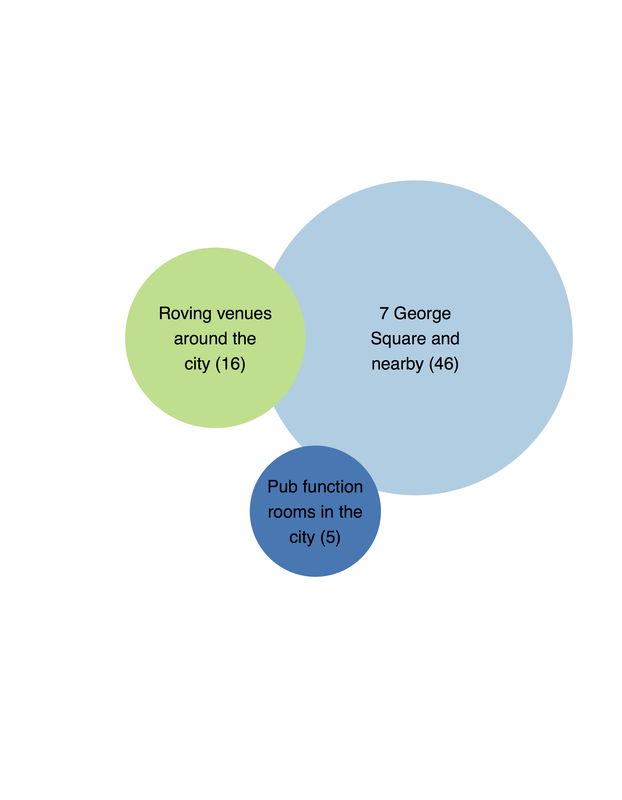 The Edinburgh R usergroup (EdinbR) put together a survey a while back to figure out some of the logistical details for organising a succesful meeting. We had 75 responses (and a few more after I grabbed the results) so here’s some quick analysis, all done in R of course. 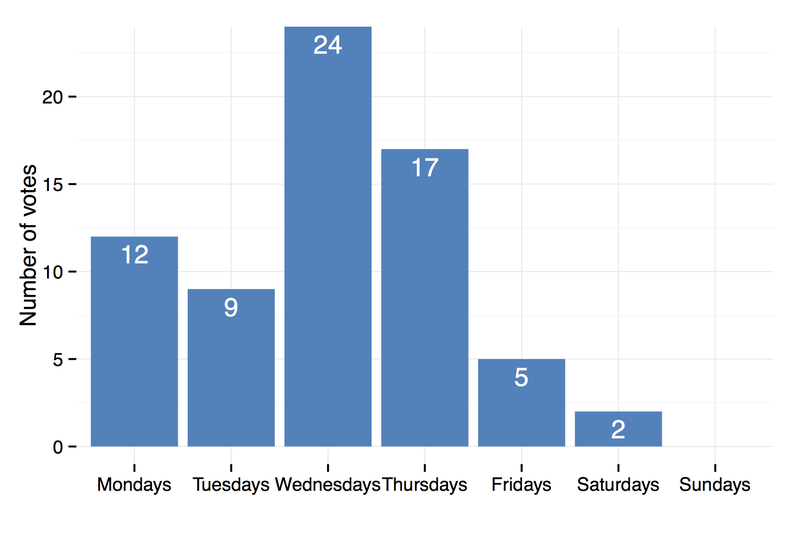 The code and data for these figures are available on the EdinbR github account. Who’s coming to EdinbR meetings? It looks like the majority of our audience would describe themselves as having an “intermediate” level of R knowledge, but there’s a good number of beginners too. 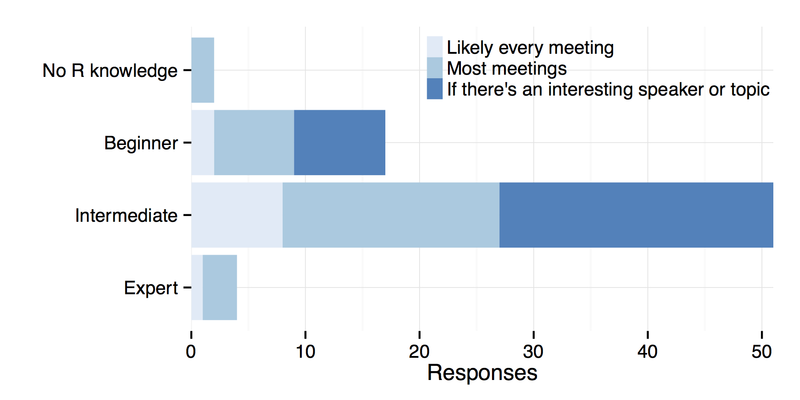 The overall number of attendees is promising: 43 said they’d attend either every meeting or most meetings! 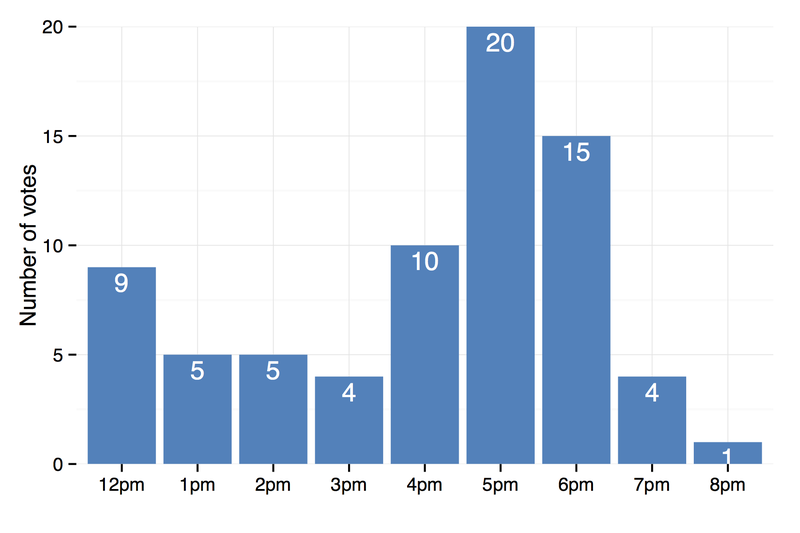 When’s the best time and day for meetings? Regardless this result means we’ll stick with Wednesdays at 5pm for now, without prejudice against lunchtime sessions in the future. Where should meetings be held? Again strong support for the status quo: George square (and Bristo square, informatics etc.) are nice, central locations which are ideal for those based in the city centre and a decent compromise for those further afield, such as EdinbR attendees from the IGMM or King’s Buildings. What do we want to hear about? This gives a rough roadmap for upcoming EdinbR meetings: if you could give a talk about any of the above topics then do let us know; you can reach me by email or on twitter, and do join our mailing list to be notified of our next meeting! 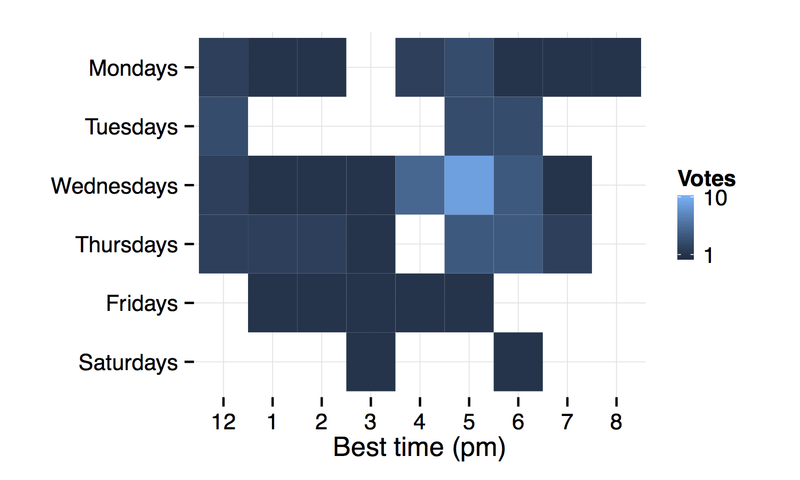 Data blog from Ben Moore, PhD student at the University of Edinburgh. 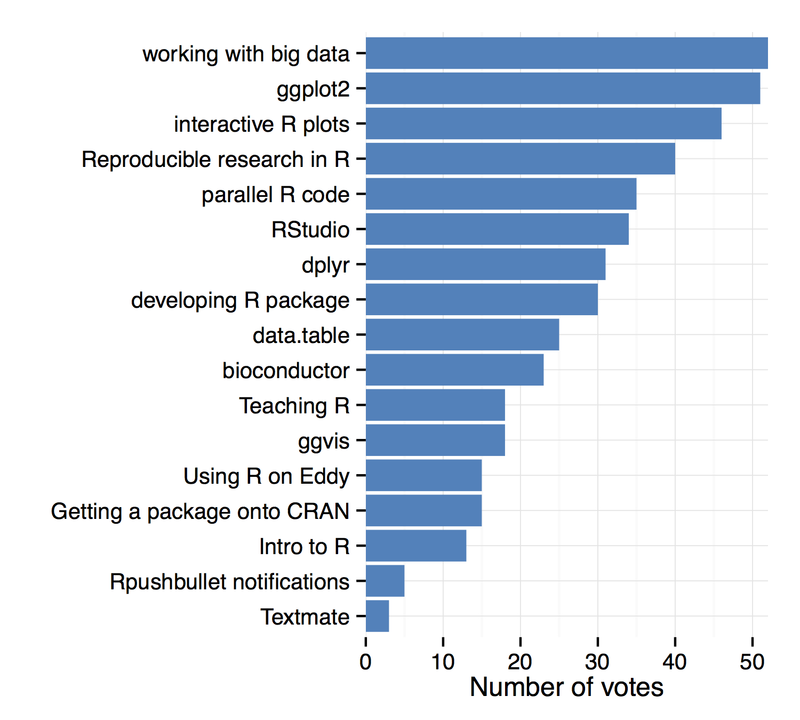 Analysis done in R or python, code to reproduce (and improve upon) is hosted on github. This blog has now moved to: blm.io/blog! Proudly part of the R-bloggers community. I also have a fledgling blog at HuffPo. Benomics by Benjamin L. Moore is licensed under a Creative Commons Attribution-ShareAlike 3.0 Unported License. Benomics · Comp. biol. et al.